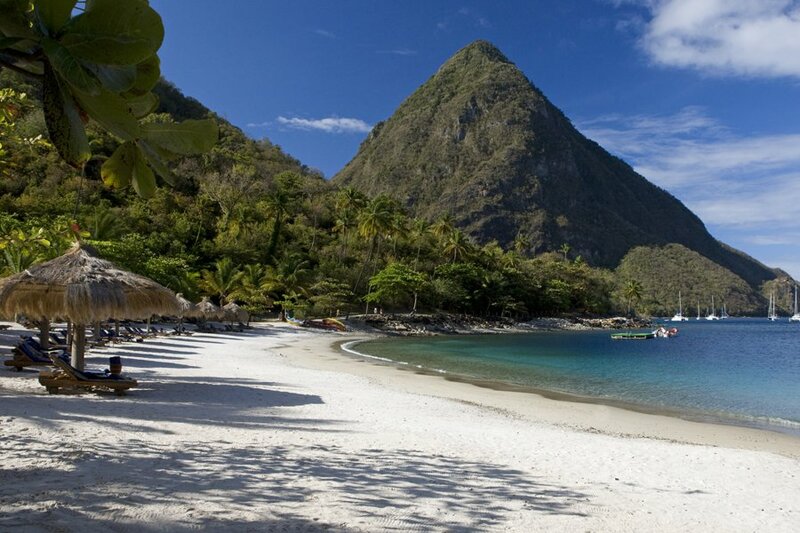 The beach and the Pitons. All photos courtesy of Sugar Beach. Contributing editor Christina Ohly was on a Goldilocks quest for the sunny holiday getaway that fit perfectly. She found it in St. Lucia. 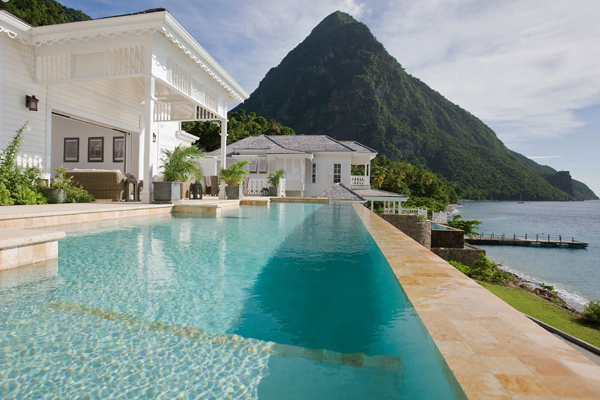 ST. LUCIA – I am forever in search of the perfect holiday destination. One that provides a bit of sun, offers plenty of activities for a diverse family of four (parents and two tweens), serves delicious yet uncomplicated food, and is serviced by large aircraft and doesn't require intricate changes of planes. I also try to avoid places with too much poolside politicking for chair and room. I don't want to fight for a sun lounger at zero dark hundred, which I've had to do too many times in the Caribbean and Mexico. Lastly (and I swear I'm not high maintenance), I prefer to stay for a shorter time — six or so nights, and not the ten-night minimum generally required at peak holiday times. Yes, it's damn near impossible to find a spot that ticks all the boxes. 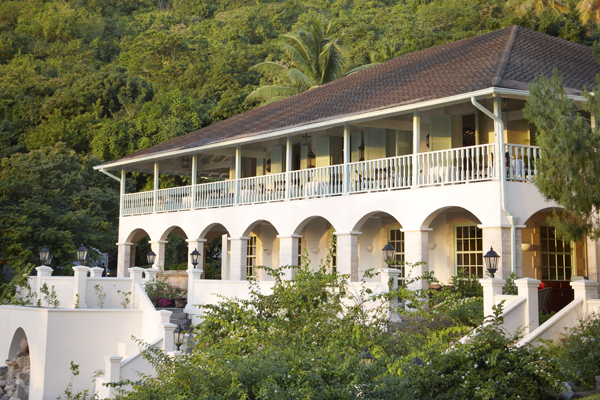 I picked Viceroy Hotel's newest resort (formerly Jalousie Plantation) on a lark after reading about it in an upscale but off-the-radar travel publication because I liked the sound of intimate villas in an informal setting. I was not disappointed. The recent $100 million+ redo has resulted in minimalist, tasteful cottages with plunge pools and all the amenities I've come to rely on (WiFi, flat-screen TVs, AC) as well as charming low-tech touches (ceiling fans and atmospheric mosquito netting canopies that are drawn each night). Sugar Beach is a completely sybaritic experience. You're waited on hand and foot — and I mean this literally, as guests are driven everywhere in Mule carts. (Mere golf carts wouldn't cut it on the the resort's steep hills.) I'm generally a pretty hearty type, but after one round trip from my room to the beachside restaurant, I got lazy like everyone else and would simply call our butler (every house has a dedicated person on call) on the small mobile phone that they give guests to arrange rides and reservations. This was the first major holiday season for Sugar Beach (read: major crush time), but I was amazed by the friendliness and efficiency of the staff, to say nothing for their ability to whisk everyone around from room to beach to restaurant with never more than a 60-second wait. The price tag, of course, is not for the faint of heart. But on the side, they don't nickel and dime you for things like WiFi, replenishing the drinks in the minibar, endless hours of Kids Club time, and snorkeling/sailing equipment. So while it is extremely expensive, you feel like you get what you pay for — quality fresh food and your every whim attended to, while keeping it all low-key and casual. There's not a lot of pretense, and that's exactly what I look for in a holiday. In fact, they did everything right. Here's the highlights reel from my week in paradise. The villa and its plunge pool. 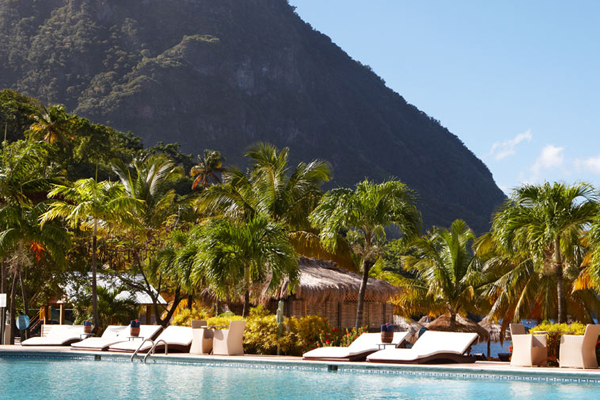 Rest, recover, and enjoy exquisite views of the dramatic Pitons in the distance. 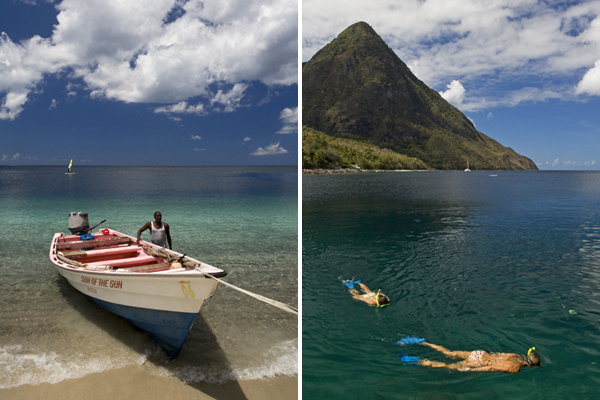 Regardless of where you're coming from (direct flights from the UK on British Airways and Virgin; three hours from Miami on American; occasional direct flights from New York on JetBlue), St. Lucia is a haul, and simply sitting once you arrive feels pretty wonderful. 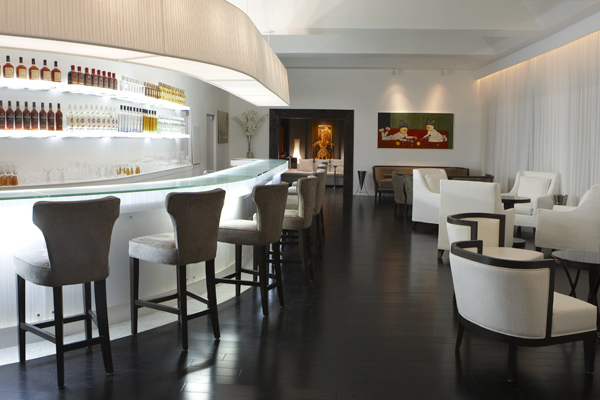 Sugar Beach whisks guests from the airport straight to their suites — no check-in or paperwork necessary — where cold drinks and a butler await. I decline the unpacking service as I feel it might take my laziness to a whole other level (though I am totally tempted), but immediately dip into my serene pool to wash away the travel grime. We head to , the casual restaurant where you can watch fisherman haul in the catch of day. We devour wood-fired pizzas and ogle international passers-by. (, rocker Chris Martin, and their adorable kids prove impossible not to watch.) This a pitch-up-in-your-swimsuit kind of place, with terrific roti, sashimi, and assorted Creole specialties. The value-oriented consumer will appreciate the abundant lunchtime salad bar filled with beautiful, locally-sourced vegetables, mountains of marinated shrimp, and ceviche made to order. There is no rush here, and guests are encouraged to relax and listen to live music, even during peak lunch and dinner services. With all the wonderful eating and lounging, a bit of movement is in order. Sailboats, sea kayaks, paddleboards, and snorkeling gear are all available, and brilliantly colored fish are just a gentle swim off the crescent beach. Full-on scuba trips, remote beach picnics, and water-skiing can be arranged, and the beach personnel are ready to grant your every wish (like cold Diet Coke) at the wave of a flag. The Great Room, inside and out. 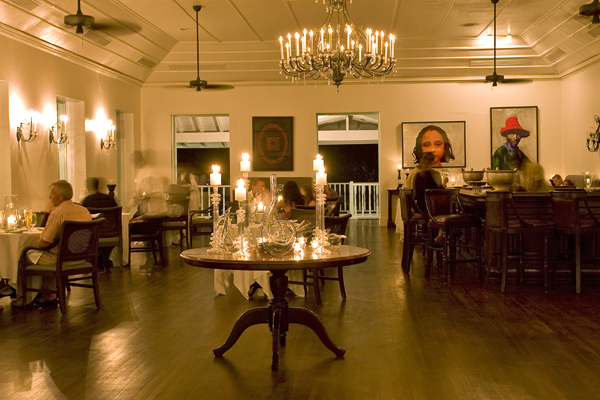 Dinner is in in the original grand plantation building, where a more formal menu (chilled organic watermelon gazpacho, roasted snapper, steaks) is served on the sweeping porch. The best thing at the Sugar Beach restaurants is the local fish (mahi mahi, tuna, shellfish galore) served raw, tiradito, roasted, grilled, or barbecued. Days start with a breakfast buffet of local fruits, cereals, and freshly baked breads, eggs made to order, and the New York Times fax. Everything is extremely casual, and my kids loved the freedom to choose chocolate pastries, then wander over to the Kids Club to hang out. Sugar Beach is wonderful for families. My kids generally bypass organized activities, but the people who run this Kids Club proved irresistible, with scavenger hunts, endless ping pong games, water balloon fights, and archery lessons. They won my MVP award. The hotel pool, which was never crowded. The pool is a large, sleek affair that, regardless of the time of day, is usually empty. 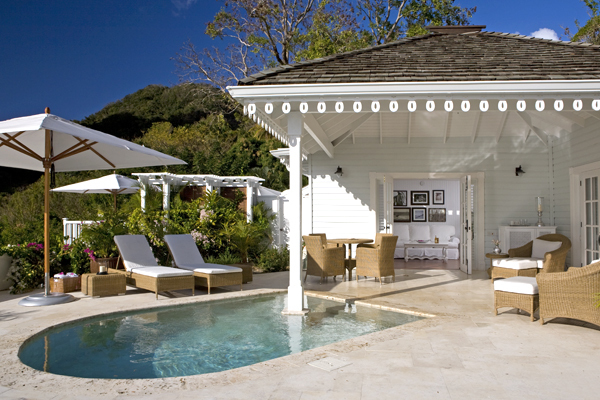 The pool chairs are tasteful white, minimalist beds, and broad umbrellas allow for peaceful reading. After a morning of relaxing (are you sensing the theme? 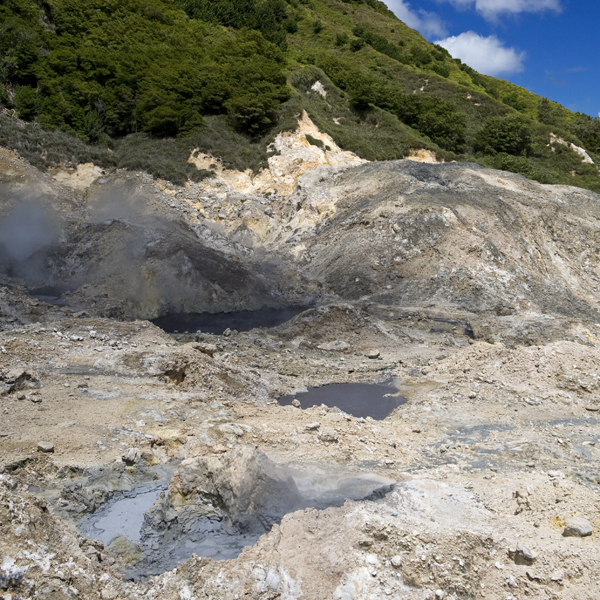 ), we explored the surrounding mountainous rain forest: the drive-in volcano and . The excursions are a great change of scene and take about 45 minutes. I'm always a fan of local shopping — particularly at grocery stores — but I'd give it a pass here, except for a Saturday morning excursion to the nearby markets in Soufriere. The drive-in volcano a short drive away. 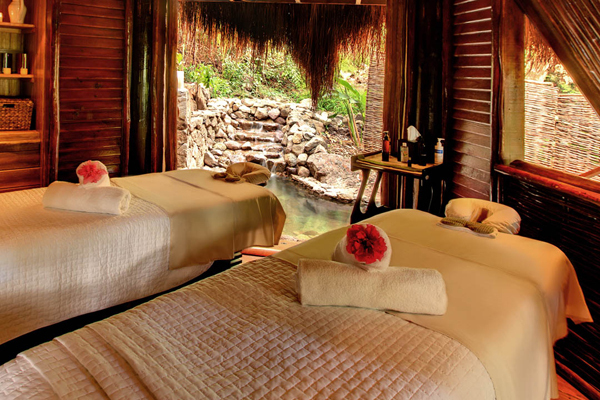 A treatment room at Rainforest Spa. Back to Sugar Beach for more pampering at the spectacular . Treatments run the gamut from hot rocks and scrubs to Ayurveda and are done in seven rooms suspended amidst the trees. I am generally one for massages and such, but this peaceful setting — and a therapist who taught me all about the island's history and the havoc wreaked by Hurricane Thomas — is unlike any other I've experienced. Mornings are the best time for tennis (less intense sun, free courts). The kids love Titus, the local pro, so we often hit twice a day. The resort's gym — an air-conditioned house with plenty of equipment, yoga mats, and TVs — is next door and offers total privacy throughout the day. 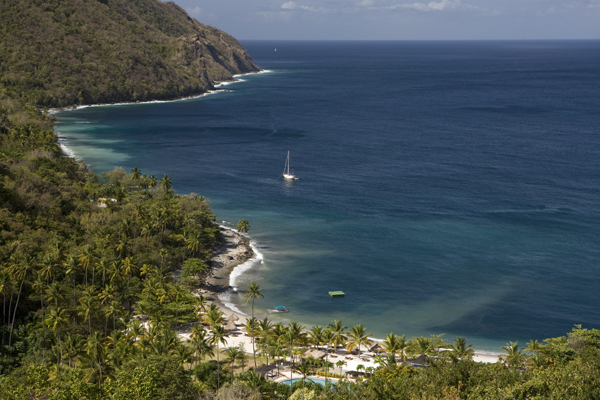 Fitness enthusiasts can take outdoor yoga classes, conditioning workshops, and hikes into the surrounding Pitons. 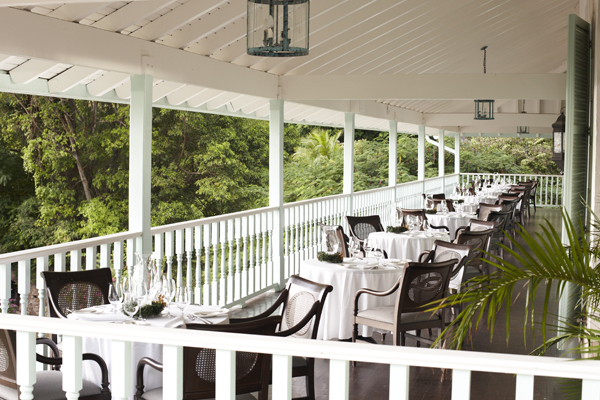 Another off-campus excursion worth the pricey cab ride takes us to lunch at , a resort nestled on the hilltop overlooking Sugar Beach. Their restaurant, Dashene, specializes in reinterpretations of traditional St. Lucian dishes made with locally harvested ingredients: jerk poulet sausage, sweet potato and coconut soup, and plantains with delicious rum sauce. This is not a light affair, and the views are spectacular. Afternoons are spent in Sugar Beach's secluded gazebos or reading in any number of well-placed hammocks. 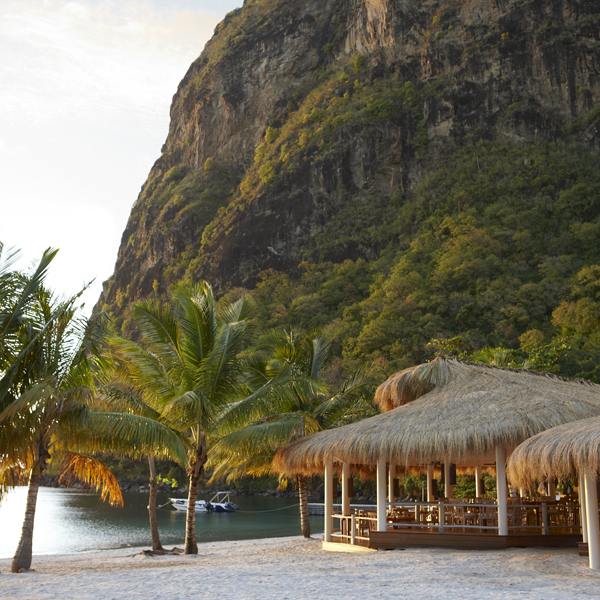 The beachside bar has delicious snacks (fish tacos, pizzettas) and killer caiprinhas, so you can just park it and watch the world go by. People-watching makes for excellent sport on the small but lovely beach. The sand is imported from Ghana and the clientele that hails predominantly from the UK and Europe. I loved this global aspect of Sugar Beach best of all. We met friendly, interesting, and lovely people throughout our stay, and I felt as though we'd been to Europe as well. Bonus! Nights are spent at the on-site restaurants, but I recommend the little-publicized , an impossibly hip new resort add-on with a pool table and ambient house music, for a local Piton beer and terrific sushi. It's also great for cocktails or a late night rendezvous, though I'd be lying f I said I had one of those during my stay. The rest of the trip was a variation on a theme. 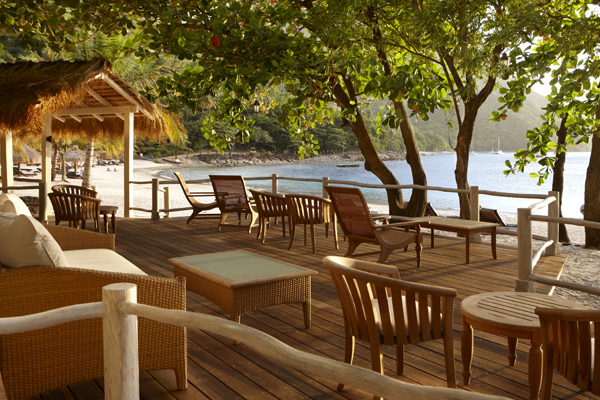 If it's complete and total relaxation you're after, you'll have no choice but to do exactly that at Sugar Beach. Fifteen back issues of The New Yorker and two novels later, I've never felt so completely Zen. Fly: Hewannora International Airport (UVF) near Vieux Fort Quarter from Miami is a three-hour flight on American Airlines. JetBlue flies direct from New York (four hours), Delta flies from Atlanta, British Airways and Virgin Airlines fly direct from the UK.